Mohammadi Doust, A., Rahimi, M., Feyzi, M. (2016). An optimization study by response surface methodology (RSM) on viscosity reduction of residue fuel oil exposed ultrasonic waves and solvent injection. Iranian Journal of Chemical Engineering(IJChE), 13(1), 3-19. A. Mohammadi Doust; M. Rahimi; M. Feyzi. "An optimization study by response surface methodology (RSM) on viscosity reduction of residue fuel oil exposed ultrasonic waves and solvent injection". 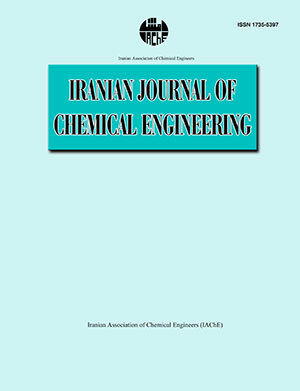 Iranian Journal of Chemical Engineering(IJChE), 13, 1, 2016, 3-19. Mohammadi Doust, A., Rahimi, M., Feyzi, M. (2016). 'An optimization study by response surface methodology (RSM) on viscosity reduction of residue fuel oil exposed ultrasonic waves and solvent injection', Iranian Journal of Chemical Engineering(IJChE), 13(1), pp. 3-19. Mohammadi Doust, A., Rahimi, M., Feyzi, M. An optimization study by response surface methodology (RSM) on viscosity reduction of residue fuel oil exposed ultrasonic waves and solvent injection. Iranian Journal of Chemical Engineering(IJChE), 2016; 13(1): 3-19. In this study, response surface methodology (RSM) based on central composite design (CCD) was applied for investigation of the effects of ultrasonic waves, temperature and solvent concentration on viscosity reduction of residue fuel oil (RFO). Ultrasonic irradiation was employed at low frequency of 24 kHz and power of 280 W. The results showed that the combination of ultrasonic waves and solvent injection caused to further reduce of viscosity. To obtain optimum conditions and significant parameters, the results were analyzed by CCD method. In this method, maximum viscosity reduction (133 cSt) was attained in ultrasonic irradiation for 5 min, temperature of 50 °C and acetonitrile volumetric concentration of 5 % by means of experimental and three dimensional response surface plots. The kinematic viscosity decreased from 494 cSt to 133 cSt at the optimum conditions. In addition, a multiple variables model was developed by RSM which the second-order effect of ultrasonic irradiation time was significant on viscosity reduction of FRO. Finally, a comparison between the RSM with artificial neural network (ANN) was applied. The results demonstrated that both models, , were powerful to predict of kinematic viscosity of RFO. The results demonstrated that both models, RSM and ANN, with R2 more than 0.99 were powerful to predict kinematic viscosity of RFO. Kent, J. A., Riegel’s Handbook of Industrial Chemistry, Springer, New York, (1983). Perry, R. H. and Green, D. W., Perry’s Chemical Engineers Handbook, McGraw-Hill, New York, (1997). Gray, M. R., Upgrading of petroleum residue and heavy oil, CRC Press, New York, (1994). Gunal, O. G. and Islam M. R., "Alteration of asphaltic crude rheology with electromagnetic and ultrasonic irradiation", J. Petrol. Sci. Eng., 26, 263 (2000). Hasan, S. W. Ghannam, M. T. and Esmail, N., "Heavy crude oil viscosity reduction and rheology for pipeline transportation", Fuel, 89, 1095 (2010). Shalaby, H. M., Refining of Kuwait’s heavy crude oil, material challenges, Kuwait Institute for Scientific Research, Petroleum Research and Studies Center, Kuwait, p. 3 (2005). David, S. J. and Pujado, P. R., Handbook of Petroleum Processing, Springer, New York, (2006). Heinemann, H. and Spelght, J. G., The Chemistry and Technology of Petroleum, Taylor and Frances Group, USA, (2006). Simanzhenkov, V. and Idem, R., Crude oil Chemistry, Marcel Dekker, New York, (2003). Allen, T. D. and Roberts, A. P., Production Operations: Well Completion, Workover and Stimulation, Oil & Gas Consultants International, Oklahoma, (1982). Hirscherg, A. Dejong, N. J. Schipper, B. H. and Meijer, J. G., Influence of Temperature and Pressure on Asphaltene Flocculation, Society of Petroleum Engineering of AIME, USA, (1984). Timothy, J. M. and John, P. L., Applied Sonochemistry: Uses the Power Ultrasound in Chemistry and Processing, Wiley-VCH Verlag Gmbh& Co. KGaA, Germany, (2002). David, J. and Cheeke, N., Fundamentals and Applications of Ultrasonic Waves, CRC Press, Canada, (2002). Mironov, M. A. Pirogov, V. A. B. Tumanyan, P. and Chelintsev, S. N., "Acoustic technology for reduction the low-temperature viscosity of petroleum products in pipelines", Chem. Petrol. Eng., 40, 13 (2004). Ensumlnger, D. and Stulen, F. B., Ultrasonic’s, Data, Equations and their Practical Uses, Taylor and Francis Group, New York, (2009). Suslick, K. S. Didenko, Y. U. and Fang, M. M., "Acoustic cavitation and its chemical consequences", Philos. Trans. Royal Soc., 357, 335 (1999). Suslick, K. S., The Chemical Effect of Ultrasound, Scientific American, USA, (1989). Shedid, S. A., "An ultrasonic irradiation technique for treatment of asphaltene deposition", J. Petrol. Sci. Eng., 42, 57 (2004). Bjorndalen, N. and Islam, M. R., "The effect of microwave and ultrasonic irradiation on crude oil during production with a horizontal well", J. Petrol. Sci. Eng., 43, 139 (2004). Hong-Xing, X. and Chun-Sheng P., "Experimental study of heavy oil underground aquathermolysis using catalyst and ultrasonic", J. Fuel Chem. Technol., 39, 606 (2011). Wang, R. Liu, J. Hu, Y. Zhou, J. and Cen, K., "Ultrasonic sludge disintegration for improving the co- slurrying properties of municipal waste sludge and coal", Fuel Process. Technol., 125, 94 (2014). Saikia, B. K. Dutta, A. M. Saikia, L. Ahmed, S. and Baruah, B. P., "Ultrasonic assisted cleaning of high sulphur Indian coals in water and mixed alkali", Fuel Process. Technol., 123, 107 (2014). Prajapat, A. L. and Gogate, P. R.,"Depolymerization of guar gum solution using different approaches based on ultrasound and microwave irradiations", Chem. Eng. Process., 88, 1 (2015). Ramisetty, K. A. Pandit, A. B. and Gogate, P. R., "Ultrasound assisted preparation of emulsion of coconut oil in water: Understanding the effect of operating parameters and comparison of reactor designs", Chem. Eng. Process., 88, 70 (2015). Dasila, P. K. Choudhury, I. R. Saraf, D. N. Kagdiyal, V. Rajagopal, S. and Chopra, S. J., "Estimation of FCC feed composition from routinely measured lab properties through ANN model", Fuel Process. Technol., 125, 155 (2014). Vasseghian, Y. Heidari, N. Ahmadi, M. Zahedi, G. and Mohsenipour, A. A., "Simultaneous ash and sulfur removal from bitumen: Experiments and neural network modeling", Fuel Process. Technol., 125, 79 (2014). Junior, N. J. Dasilva, A. A. and Marques, M. R. D. C., "Enhanced diesel fuel fraction from waste high-density polyethylene and heavy gas oil pyrolysis using factorial design methodology", Waste Manag., 36, 166 (2015). Kumar, S. Chary, G. H. V. C. and Dastidar, M. G., "Optimization studies on coal-oil agglomeration using Taguchi (L16) experimental design", Fuel, 141, 9 (2015). Bendebane, F. Bouziane, L. and Ismail, F., "Extraction of naphthalene, optimization and application to an industrial rejected fuel oil", J. Ind. Eng. Chem., 16, 314 (2010). Doust, A. M. Rahimi, M. and Feyzi, M., "Effects of solvent addition and ultrasound waves on viscosity reduction of residue fuel oil", Chem. Eng. Process., 95, 353 (2015). Standard Test Method for Kinematic Viscosity of Transparent and Opaque Liquids (and Calculation of Dynamic Viscosity), (2012). Standard Test Method for Density, Relative Density, or API Gravity of Crude Petroleum and Liquid Petroleum Products by Hydrometer Method, (2012). Standard Test Method for Pour Point of Petroleum Products, (2012). Standard Test Method for Ash from Petroleum Products, (2012). Standard Test Method for Flash and Fire Points by Cleveland Open Cup Tester, (2012). Montgomery, D. C., Design and Analysis of Experiments, 7th ed., John Wiley and Sons, New York, (2008). Sahan, T. Ceylan, H. Sahiner, N. and Aktas, N., "Optimization of removal conditions of copper ions from aqueous solutions by Trametes versicolor", Bioresource Technol., 101, 4520 (2010). Torrades, F. Saiz, S. and Garcia-Hortal, J. A., "Using central composite experimental design to optimize the degradation of black liquor by Fenton reagent", Desalination, 268, 97 (2011). Tsapatsaris, S. and Kotzekidou, P., "Application of central composite design and response surface methodology to the fermentation of olive juice by Lactobacillus plantarum and Debaryomyces hansenii", Int. J. Food. Microbiol., 95, 157 (2004). Wang, H. Liu, Y. Wei, S. and Yan, Z., "Application of response surface methodology to optimise supercritical carbon dioxide extraction of essential oil from Cyperus Rotundus Linn", Food Chem., 132, 582 (2012). Chen, Y. Zhao, L. Liu, B. and Zuo, S., "Application of response surface methodology to optimize microwave-assisted extraction of polysaccharide from tremella", Phys. Procedia, 24, 429 (2012). Yetilmezsoy, K. Demirel, S. and Vanderbei, R. J., "Response surface modeling of Pb(II) removal from aqueous solution by Pistacia vera L.: Box–Behnken experimental design", J. Hazard. Mater., 172, 551 (2009). Va´zquez, G. Calvo, M. Freire, M. S. Gonza´ lez-Alvarez, J. and Antorren, G., "Chestnut shell as heavy metal adsorbent: Optimization study of lead, copper and zinc cations removal", J. Hazard. Mater., 172, 1402 (2009). Cornell, J. A., How to Apply Response Surface Methodology, 2nd ed., American Society for Quality Control, Wisconsin, (1990). Bayraktar, E., "Response surface optimization of the separation of DL-tryptophan using an emulsion liquid membrane", Process Biochem., 37, 169 (2001). Myers, R. H. and Montgomery, D. C., Response Surface Methodology: Process and Product Optimization Using Designed Experiments, 2nd ed., John Wiley & Sons, USA, (2002). Aghaie, E. Pazouki, M. Hosseini, M. R. Ranjbar, M. and Ghavipanjeh, F., "Response surface methodology (RSM) analysis of organic acid production for Kaolin beneficiation by Aspergillus niger". Chem. Eng. J., 147, 245 (2009). Bahrami, H. Kheradmand, A. Shafiee, M. and Ramazani, S. A., "Preparation of Ultra High Molecular Weight Polyethylene Using ziegler-Natta Catalyst System: Optimization of Parameters by Response Surface Method". Iranian J. Chem. Eng., 11 (1), 55 (2014). Salamatinia, B. Zinatizadeh, A. A. Kamaruddin, A. H. and Abdullah, A. Z., "Application of Response Surface Methodology for the Optimization of Cu and Zn Removals by Sorption on Pre-treated Oil Palm Frond (OPF)", Iranian J. Chem. Eng., 3 (2), 73 (2006). Soleymani, F. Pahlevanzadeh, H. Khani, M. H. and Manteghian, M., "an Biosorption of cobalt (II) by Intact and Chemically Modified Brown Algae: Optimization Using Response Surface Methodology and an dynamic Equilibrium", Iranian J. Chem. Eng., 11 (2), 56 (2014). Ozer, A. Gurbuz, G. Calimli, A. and Korbahti, B. K., "Biosorption of copper(II) ions on Enteromorpha prolifera: Application of response surface methodology (RSM) ", Chem. Eng. J., 146, 377 (2009). Preetha, B. and Viruthagiri, T., "Application of response surface methodology for the biosorption of copper using Rhizopus arrhizus", J. Hazard. Mater., 143, 506 (2007). Leontartits, K. J. and Mansoori, G. A., "Asphaltene Deposition: A survey of field experiences and research approaches", J. Petroleum Sci. Eng., 1, 229 (1988). Fuse, T. Hirota, Y. Kobayashi, N. Hasatani, M. and Tanaka, Y., "Characteristics of low vapor pressure oil ignition developed with irradiation of mega hertz level ultrasonic", Fuel, 83, 2205 (2004).